Published: Oct. 7, 2018 at 03:09 p.m.
Baltimore Ravens running back Javorius Allen fumbles the ball and Cleveland Browns defensive tackle Trevon Coley recovers the ball. 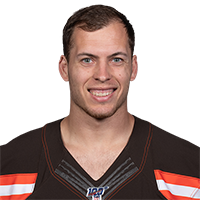 Published: Sept. 20, 2018 at 11:35 p.m.
Cleveland Browns Joe Schobert makes diving interception off New York Jets quarterback Sam Darnold late in fourth quarter. Published: Sept. 9, 2018 at 04:25 p.m.
Cleveland Browns defensive end Myles Garrett strip sacks Pittsburgh Steelers quarterback Ben Roethlisberger and the Browns recover. Published: Oct. 29, 2017 at 09:53 a.m.